The yearbook is a classic souvenir of high school days, but today even elementary and middle schools are getting into the act with their own memory books. Preserving the priceless moments and toothless smiles of young children, who often won't recall much of what occurs in their early years, is the admirable goal of the hardworking advisors, parents, and students who make these yearbooks a reality. "I truly believe that the students can and should create the yearbook," Amy Bice says. "What I always say to my students is, 'It's not my yearbook; it's yours.'" Every spring, students endure a 4-day interview process before they are "hired" as members of the Brawley Middle School yearbook staff. Bice, a computer teacher at the Mooresville (North Carolina) school, has the team working on plans for the next year's book as soon as the selection process is finished. "It all starts with an individual assignment to find images of layouts the students would like to see in the yearbook," reports Bice. "Layouts can come from anything -- a Web site, movie poster, newspaper, magazine, anywhere. As students bring in their ideas, we post them on the wall and discuss what it is the students like about each." The ideas gathered by Bice's yearbook staff are the source of inspiration for the cover of the book and its theme. The students are involved in every phase of development. They take all of the non-group and portrait pictures, with about 1,000 student-captured images appearing in the finished product. They also edit the photos on their own. "The staff is split into four teams, with a leader for each," Bice explains. "The students work within their teams to complete their assignments, and once we start working on the actual book, if questions arise on the overall direction, the team leaders make the decision on what direction we will take." Computer teacher and yearbook coordinator Amy Bice and her staff of middle school students have created award-winning yearbooks that enable the kids to treasure their middle school memories for years to come. Here is her advice for new coordinators. Find out what other advisors have done. Ask about what has worked and what has not in the past. Learn why things did not work. Strive to include all students in the yearbook. 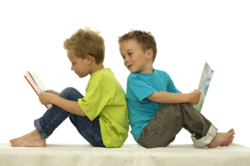 Analyze the content and ensure that the book contains room for all students to appear equally. Keep in mind that the book is for and about the students. Let go of your ideas of what the book should be and listen to the students' opinions. Choosing questions to be asked and obtaining quotes are also the responsibility of students, as well as putting this information together into a page. Before each page is submitted, the students proofread each other's work and examine the entire section for cohesiveness. It is the students who determine what pages will be submitted for each deadline at the beginning of the school year. "The most critical step in planning a yearbook is to work within the deadlines. There is no option but to make each and every deadline," observed Bice. "If you go into it thinking that it's no big deal if you don't make deadline, you won't make deadline. We take each deadline and plan backwards to ensure enough time is provided for each stage of the process." Bice and her students use the Jostens yearbook publishing service and have won awards for design and content. This year's team leaders spoke at a yearbook workshop sponsored by the company and shared their development process for the Brawley Middle School yearbook. The Jostens online package is easy to navigate, and its support service provides consistent assistance, Bice has found. Her local representative can be reached at any time for creative guidance or to discuss financial issues. She is supportive of the staff, providing guest speakers to help students gain perspective. Technical help comes directly from the Jostens technical center. "I love the process, and the students do an amazing job," Bice added. "It's incredible what students can do when they feel empowered. They are creating a published book that will be looked at by thousands of people the first weekend it comes out and examined for years to come. I could not be prouder of the level of work that comes from these 11-14 year olds." Video production teacher Jeff Rudkin shares Bice's philosophy that the students should take charge of "their" yearbook. His seventh and eighth graders at Lora Batchelor Middle School in Bloomington, Indiana, have produced a two-hour video yearbook every year since 1996. It contains clips of each of the school's athletic teams, music groups, clubs, and more. "Our students shoot the footage throughout the year," Rudkin reported. "We shoot several games of each team, so our highlights are truly highlights. The students also take digital stills of kids and faculty for slideshows to be included. The students edit the entire thing as well. They do it all." "The students have created some traditions, and they work hard to paint a complete picture of student life here at Batchelor Middle School." The video yearbook has an advantage over the traditional printed yearbook because it is comprised of live footage that the students can watch and enjoy for years to come, Rudkin suggests. More than simply perusing photos, they can hear the voices and really "see" what happened. "I like that the video yearbook is entirely student-produced," he added. "The students have created some traditions, and they work hard to paint a complete picture of student life here at Batchelor Middle School." Interestingly, Rudkin has discovered that the students often have a much better perspective on this project than would a professional videographer. They include all teams and groups and start work in September, taking the project one step at a time. When the students complete segments of the video yearbook, the material is finished and saved to avoid the editing of fall footage in May. "Keep the cameras rolling, and let the kids create something unique," Rudkin recommended. "Keep it in good taste, but make it a showcase of the school." While video can bring images to life, photos of poor quality can be the death of the printed yearbook. "Probably the most common mistake made in designing yearbooks is using poor photographs," Denise Lakin cautions. "It is essential to find a good computer program that will allow you to edit photos. Teach students to use cameras and take thousands of pictures! You can teach staff how to use composition in photography. It will pay off." "Creating a book that contains your school history is a huge responsibility." Posed photos of kids and peace signs don't cut it in the yearbook of North Tapps Middle School. An art teacher who has served as yearbook advisor for 19 years, Lakin believes that every photo in the book must tell a story. "I think our book is unique because we start with a good theme and build our book around that," she explained. "Each year we try to be sure the book has an entirely different feeling -- serious, playful, and so on -- so it's totally different from the year before." Eighteen students in Lake Tapps, Washington, are involved in the building of the yearbook. They select the theme, plan layouts, take photos, and write captions, and the students' work has won awards each of the last six years. After working with other yearbook companies, Lakin met with representatives of Lifetouch and liked what they had to offer. Today she is a member of the Lifetouch "Think Tank," a group of advisors who preview and comment on yearbook products like covers and endsheets. In this role, she also provides ideas about how to run yearbook sales, form staffs, and more. "Lifetouch has a wide variety of programs that allow you to use as much technology as you feel comfortable using," stated Lakin. "The company offers great communication. The best thing about it is that my questions are answered right away by a yearbook representative who cares." A huge advantage to Lakin is viewing completed pages online, so that there are no surprises when the yearbooks arrive in June. Having many choices in fonts, ink color, cover materials also allows her and her staff to personalize the books. She feels that the quality of the books themselves is excellent. From the beginning, Lakin wishes she had recognized the importance of selecting a good theme that relates to the specific year and constructing the yearbook around that theme. Now she also knows the value of good copy that withstands the test of time. "Creating a book that contains your school history is a huge responsibility," added Lakin. "Be prepared to put in some long hours." "Our goal is to provide students with photographic memories of their years in Hartly (Delaware) Elementary 'Where Everybody Is Somebody Special' at a price that is as close to cost as possible," shares Nancie Robinson. Three years ago, when the yearbook was created by cut-and-paste, a committee of teachers, parents, and fourth graders designed it. Last year, the yearbook was for the first time created online and published professionally. Because it was the first year, Robinson, who is secretary to the principal and co-chair of the yearbook, encouraged submissions from classes, but she and other adult helpers entered and submitted all data. With yet another company to work with this year, the technical specifics are again new, so the reestablishment of a student committee has been postponed. "Students love submitting their work and then seeing it in print," Robinson told Education World. "Our yearbook is a compilation of student and staff portraits and candid photos. Probably my favorite element is the quote inserted on every candid page, such as 'Today you are You, that is truer than true. There is no one alive who is Youer than You,' by Dr. Seuss." The experience of working with various publishing services has taught Robinson that it is important to use a Web-based operation. Some programs must be loaded onto one computer, making it the only machine through which the material may be accessed. She's careful to choose a company that provides access from any location at home or school. "Be sure to ask questions like: Do you charge for shipping? Is there a charge for parents to order online? These are just a couple of the things that can add to the cost of your yearbook and lower your profit margin," Robinson advises. "Try to cover every angle before signing that contract. Once it's signed, you are locked in. Only sign for one year in the beginning, until you are sure it is a good deal. You should know after the first year." "Making the yearbook is a lot of fun," says Susan Sanders. "I love seeing the kids' faces when they see themselves in the book. My kids look at theirs a lot!" Sanders is a parent volunteer who coordinates a yearbook for Buffalo Ridge Elementary in Castle Rock, Colorado. She uses Inter-State Studio, a family-owned school photography and yearbook publishing company. Its design software is online, so she and other volunteers work from home on their personal computers. "I love seeing the kids' faces when they see themselves in the book. My kids look at theirs a lot!" "I like that the yearbook is easy to do," Sanders observed. "When you have your pictures uploaded, it doesn't take much time." While many hands can be helpful in taking pictures, Sanders finds that it is best to have only a core group of volunteers handle the actual design work. A new feature of the 2007-2008 yearbook is a "world year in review" section that will include events and headlines, the approximate cost of a few retail items, and more. Because Buffalo Ridge is a K-5 school, the fifth grade is given special attention in the book. "We do a 'favorites' list that the fifth graders fill out," said Sanders. "We also use their baby pictures just to show how much they have changed. Our fifth graders are moving on to middle school for sixth grade, so it is kind of like they are the seniors of our elementary school."